The March 2009 issue of the SAA Archaeological Record focused on International Curation Standards. In that issue, Julia King wrote, “The digital delivery of archaeological information has tremendous promise and is the wave of the future, but the creation, management, and long-term preservation of digital information is challenging, complex, and…expensive.” This is a case study of how the Museum of Anthropology at Wake Forest University developed and implemented a database system and online information service to support archaeological research and teaching at multiple levels. The Museum of Anthropology at Wake Forest University creates awareness of global cultures by collecting, protecting, managing, and exhibiting archaeological artifacts, ethnographic objects, and visual arts of past and present peoples, and providing opportunities for intercultural learning. The museum was established by the faculty of the Department of Anthropology in 1963 to broaden learning opportunities for students. The museum’s collections, exhibits, educational programs, and outreach have since grown extensively. The Museum of Anthropology’s collections of approximately 28,000 archaeological and ethnographic objects represent ancient and contemporary traditional non-Western cultures from around the world. No other museum in North Carolina has such a diverse collection. The first and only exposure many people have to the cultures represented in this collection is through exhibits and outreach programs. The collections are used for teaching university and K–12 students, in public outreach, for long-term exhibits and loans to other institutions, and are the basis of scholarly publications and academic theses. Until 2005, the Museum of Anthropology had no registrar or collections manager, and creation of paper and computer database records fell to staff and students when they could spare time from their regular duties. Distractions and inadequate training led to errors and inconsistencies in both physical and digital records. Few objects were photographed. Due to a history of trying several data-management programs, all developed primarily for business applications and designed in-house, digital records did not have consistent lexicon categorization and some data from physical records were not in the computer catalogue. The museum eventually settled on ACCESS for its digital records, but the database was designed and installed by a person who was not knowledgeable about the program or the museum’s needs. The database was in spreadsheet format, with fields not logically ordered for efficiency of data entry or retrieval. Search, select, sort, and copy manipulations were inefficient and frequently did not function as intended. The staff attempted to complete and clean up the ACCESS catalogue, but progress was slow and the collections and related research had grown to the extent that the system did not meet data management needs. Finally, we decided that a data-management program designed for museums would bring order and consistency to the management of collections and allow for complete data recording. A consistent and up-to-date catalogue would permit the staff to focus on current registration and cataloguing duties, facilitate access to and use of collections, and reduce staff time, effort, and wear on collections. Three successive grants from the Institute of Museum and Library Services’ Museums for America program funded the three phases of this digital database project. The purpose of Phase 1 was to create a new computerized database of the Museum of Anthropology’s collections of archaeological and ethnographic objects so that the staff and public could access useful and accurate records of all objects quickly and effectively. Visual Re:discovery is a relational database that presents basic data in a catalogue card format visible on one screen, facilitating rapid access and retrieval. In addition to Collections Management and Photograph Management modules, a Lexicon module assists with maintaining consistency of field terms so that indexing and retrieval are complete with no items omitted due to improper terminology. We installed the new database and migrated data onto a server at Wake Forest University. A newly hired registrar inputted new records into the database and corrected migrated records. Working with Re:discovery database records proceeded much more rapidly than anticipated. We were generally pleased with Re:discovery as a database management tool for museum staff use. We installed a public-access computer terminal with connection to the database in a museum gallery and guided members of the public and Wake Forest University students in the use of the database for research and course support. This aspect of Phase 1 was not a complete success. The public-access version of Re:discovery was inflexible and search results were not visually or intellectually stimulating. In addition, we installed the database on a server that handled large amounts of data, so searches were extremely slow, severely limiting the appeal for researchers. In Phase 2 we updated the computerized database and integrated photos of objects so that staff and members of the public were able to access accurate records and images of all objects quickly and effectively though the web, using Visual Re:discovery for Internet software. Included in the public version of the database on the website are a research guide, an online catalogue, K–12 lesson plans, and answers to frequently asked questions. The overall goal of Phase 3 was to provide broad public access through the web to cataloguing information and digital images for the archival collection. Access to the archival collection through Re:discovery Proficio software is meant to enhance classroom teaching and research for faculty and students; support curriculum- based learning by students in primary and secondary schools; facilitate research into the context of traditional material culture by scholars; and permit the general public to learn about traditions and modernization of peoples throughout the world. Public access is through the museum’s website. Web-use manuals are being written for the museum staff, educators, and the public, and four workshops will instruct primary and secondary school educators in how to use the web archives with their students. 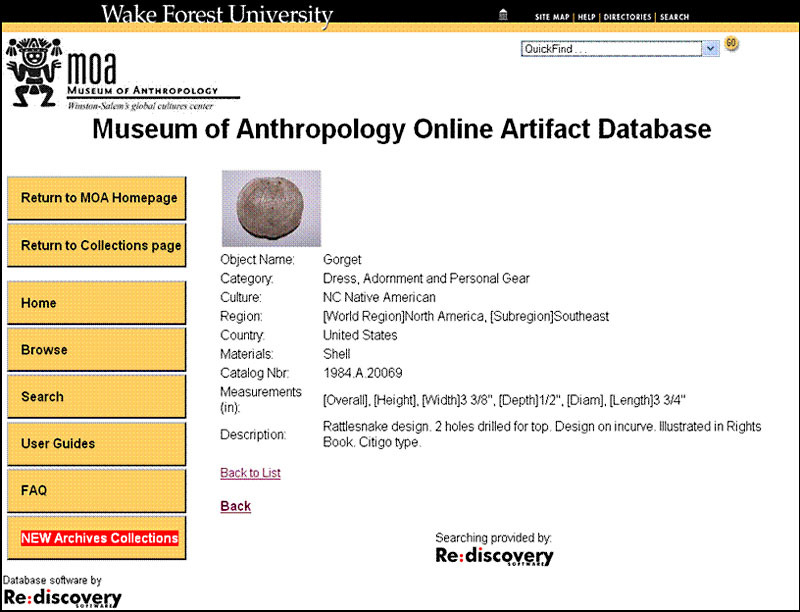 The Online Artifact Database is accessible through the museum’s website (www.wfu.edu/moa/database) and contains 26,207 records, of which 22,764 are for archaeological artifacts. The archives module contains 4,734 records, a minority of which relate to archaeological sites. Museum of Anthropology staff members have promoted the database through presentations to the public, K–12 educators, and faculty from institutions of higher learning since before it had been released to the public. The public launch of the database occurred on September 9, 2008. Print media and Internet-based listserves quickly spread news about its existence and people started to explore it remotely. The pace of promotion activities has increased since its official launch. The director and museum educator spoke about the database at meetings of Wake Forest faculty and staff from the departments of Anthropology, Art, Education, Health and Exercise Science, and History. The museum’s educator also presented workshops for teachers in the Winston-Salem/Forsyth County School District. 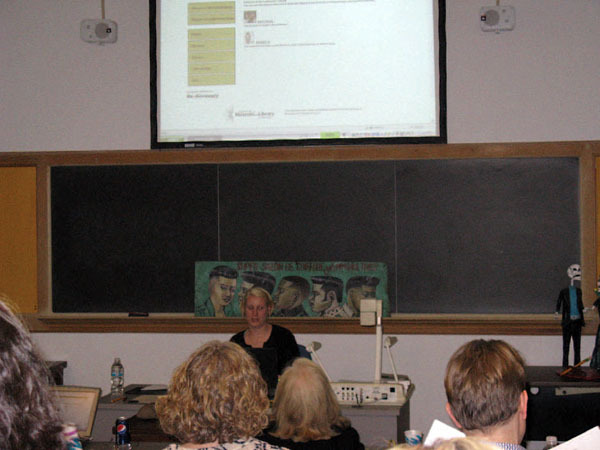 In early 2009, the museum presented a faculty workshop entitled “Using Museums to Support Interdisciplinary Curriculum in Undergraduate Teaching” for an enthusiastic group of 27 faculty members from Wake Forest and five other local colleges and universities. In addition to the director and registrar, presenters included Katherine Hart from the Hood Museum of Art at Dartmouth College and Carin Jacobs from the Center for Arts, Religion, and Education at the Graduate Theological Union. Innate interest in the topic was augmented by a $200 stipend to faculty members who attended. Wake Forest faculty members from the departments of Anthropology, Art, Classical Languages, Communication, Economics, Education, History, Political Science, Romance Languages, and Theatre and Dance left with ideas and skills related to object-based learning, using museums in the classroom, and the teaching and research potential of the database. To date, seven workshop participants have used the database in teaching. Four additional Wake Forest faculty members have used it in connection with their teaching, even though they did not attend the workshop. The majority of faculty who taught with the database indicated their satisfaction with the resource and plan to use it again in future courses. Workshop participants sent us concrete examples of how they implemented what they learned in their classrooms. To encourage attendees to put their new knowledge into practice, each became eligible for an additional $200 stipend upon submission of a course syllabus and any student projects that resulted from implementing methods introduced in the workshop. We plan to share examples through the support pages of the database itself. Museum staff members have presented at state, regional, national, and international conferences during the past year and one article has been published in the Proceedings of DigCCurr 2009: Digital Curation Practice, Promise and Prospects. By the end of October 2009, we directly introduced the database to approximately 1,336 K–12 educators, 203 university faculty and staff members, and 138 conference attendees. The K–12 educators are excited by the potential of the Online Artifact Database to expand their teaching and their students’ learning in new directions. Conference attendees are interested in finding out how they can emulate what we have done. University and college faculty members near the beginning of their careers are the most accepting of the database and willing to incorporate it into their teaching and research. Initial results show that the Online Artifact Database has many uses in teaching and research. Ninety-four university students in an Introduction to Archaeology course used the database to answer questions about North American archaeology. They compared and contrasted Archaic and Paleo-Indian life based on artifacts in the database, compared similarities and differences in Archaic objects from the Southeast and Southwest to reconstruct culture, and studied ax technology around the world. 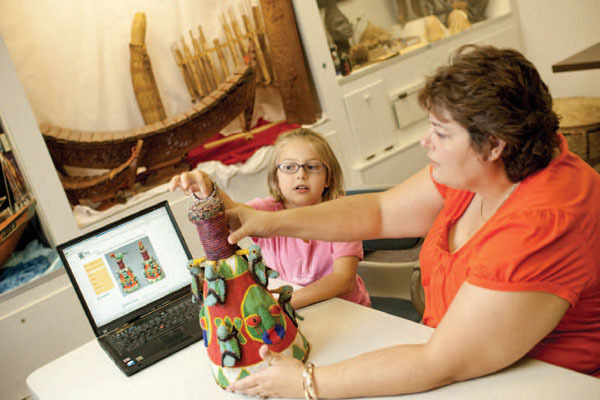 In a Spanish conversation class, students used the database to find objects made by ancient or contemporary peoples of Central and South America. The students kept a diary of their experiences, did an oral presentation on objects they chose, and wrote two papers. The Davidson County Historical Museum contacted us to borrow archaeological artifacts from North Carolina for a planned book and 18-month exhibit. We directed Jim Daniel, the exhibit’s curator, to the database to aid him in the selection of artifacts both to illustrate the book and to use in the exhibit. It was much easier for him to search the database for specific classes of artifacts and then review photos of the pertinent objects than to sort through storage containers with more than 20,000 pieces. We track visitors to the Online Artifact Database and Archives Module using Google Analytics. Between the database launch on September 9, 2008, and March 31, 2010, the database website had 4,693 visits. There were 89,717 page views, averaging 19.1 per visit, which lasted an average of 7 minutes and 48 seconds, and 70.7 percent of visits were new. Visits came from 65 countries or territories, with a majority from the United States. The three phases of this project provide the staff of the Museum of Anthropology at Wake Forest University with physical and intellectual control of our object and archival collections and permit us to fulfill our educational mission. By making the Online Artifact Database freely accessible to anyone using the web, we provide research and teaching support for our university and reach out to visual learners worldwide. A challenge we are facing now and in the future is to increase acceptance throughout the academy. This project was supported in part by grants from the Institute of Museum and Library Services through the Museums for America program. Any views, findings, conclusions, or recommendations expressed in this publication do not necessarily represent those of the Institute of Museum and Library Services. Wake Forest University support came from the Dean of the College, Department of Anthropology, Instructional Services, Office of Research and Sponsored Programs, Provost’s Fund for Academic Excellence, and Social, Behavioral, and Economic Science Research Fund. We gratefully acknowledge the contributions of Museum of Anthropology staff member Sara Cromwell and numerous students, Wake Forest staff member M. Robert Vidrine, and the support of the Museum of Anthropology Advisory Board. The American Indian in North Carolina. Duke University Press, Durham. “Web Access for the Museum of Anthropology’s Collections.” In Proceedings of DigCCurr 2009: Digital Curation Practice, Promise and Prospects, edited by Helen R. Tibbo, C. Hank, C. A. Lee, and R. Clemens, pp. 149–154. University of North Carolina, Chapel Hill. The Museum of Anthropology at Wake Forest University was founded in 1963 and was established by the faculty of the Department of Anthropology to broaden the learning opportunities for their students. Since its inception, the Museum's educational role has expanded greatly into the Winston-Salem and Triad communities. Inquiries or comments about the Online Artifact Database are welcome. Please send them to Stephen L. Whittington at whittisl@wfu.edu.